7:30 PM - 11:30 PM GRILLS GETS DOWN FOR THE THIEVES! The Umbrella Thieves Come join your favorite local band and Drink, Sing, and Dance like everybody's watching!! 7:30pm - 11:30 pm Funpipe Rocks Grills Riverside FunPipe Ready for some Hard rockin on the river! 3:00 PM - 7:00 PM Sunday Fun with Bittersweet! Bittersweet Join us for a beautiful Sunday afternoon on the river! 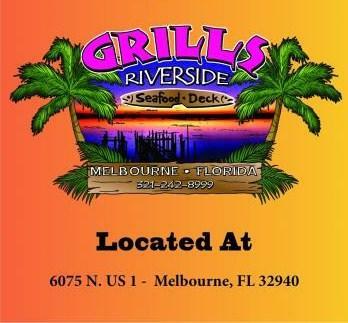 7:30 PM - 11:30 PM Banjoman rocks Grills Riverside! Banjoman Franklin Smokin on the water! 6:00 PM - 10:00 PM Sunday evening with The Electric Frogs The Tree Frogs We will be playing some great classic tunes from the '60s & '70s! Don't forget to bring your friends! 6:00 PM - 10:00 PM Sunday evening with The Electric Frogs The Electric Frogs We will be playing some great classic tunes from the '60s & '70s! Don't forget to bring your friends! 3:00 PM - 7:00 PM Sunday Fun with Bittersweet! Bittersweet Join us at Grills Riverside for a relaxing Sunday on the river! 7:30 PM - 11:30 PM Banjoman Returns to Grills Riverside! Banjoman Franklin Live on the River! 3:00 PM - 7:00 PM Sunday afternoon with The Electric Frogs The Tree Frogs We will be playing some great classic tunes from the '60s & '70s! Don't forget to bring your friends! 3:00 PM - 7:00 PM Sunday afternoon with The Electric Frogs The Electric Frogs We will be playing some great classic tunes from the '60s & '70s! Don't forget to bring your friends!